It is not something many of us will have to face over our lifetime, but what do you do when your collection of standard-issue Rolex Daytonas starts to feel a bit commonplace? That was the ‘problem’ confronting Formula 1, NASCAR and IndyCar legend Juan Pablo Montoya, a huge fan of the world’s favorite chronograph. Over the years, the Colombian racecar champion has amassed, in his own words, ‘about seven or eight’ of this decade’s most sought after watch—three of them presented to him personally by the brand for his trio of victories at the Rolex 24. It may well have the most variety of any of the professional collection, but sometimes owning the same Daytona available to anyone with enough buying power or patience or both just doesn’t cut it anymore. In that situation, it’s time to start the hunt for something a little different. Enter Les Artisans de Genève. The Geneva-based modification workshop is a relatively recent introduction to the industry, but one slowly making a name for itself through both their meticulous work and their collaboration with some big and intriguing names. 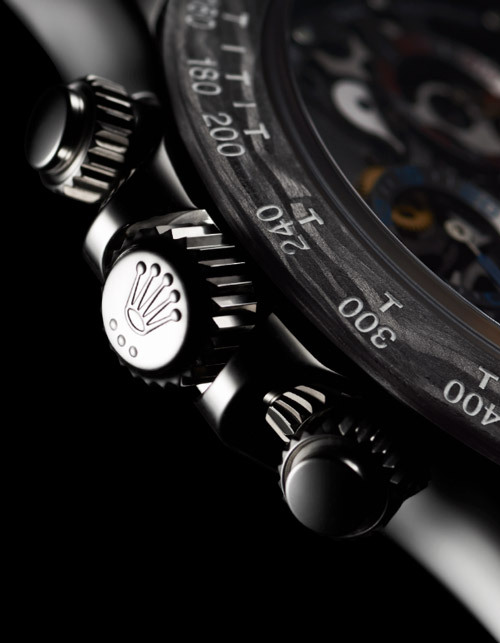 The Rolex Daytona has featured prominently in their output so far. 2016 saw them reworking a contemporary ref. 116520 to resemble one of the most iconic models in the canon, the Big Red ref. 6263 from 1967. Since then they have paired up with the likes of Spike Lee and Lenny Kravitz to develop unique variations on the Cosmograph theme, producing signature looks inspired by each man’s body of work. With the La Montoya, Artisans de Genève have again used the ref. 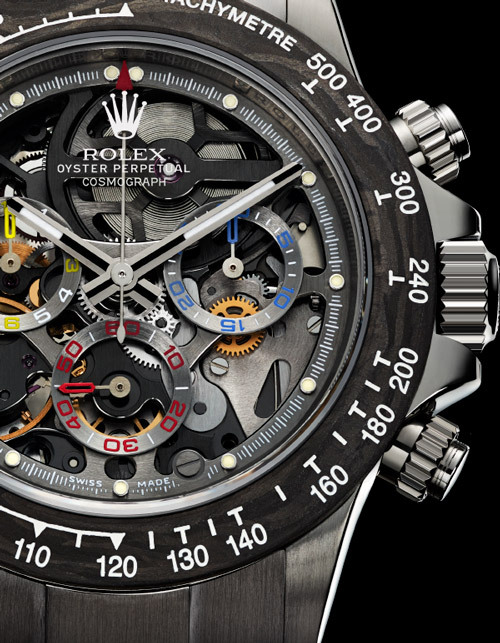 16520 as a base, and created the world’s first skeletonized Daytona, a process which has taken them more than two years to perfect. The movement itself, Rolex’s in-house Cal. 4130, has been stripped down, with the bridges, main plate and drum all made openwork. The standard rotor has been replaced with one in the group’s trademark 22k grey gold, and every component has been brushed and beveled over hundreds of hours before being painstakingly reassembled by hand. It gives a caliber recognized as one of the finest chronograph movements ever made an aesthetic appeal to match its performance, and is a world away from Rolex’s usual workmanlike finishing. To cap it all, a sapphire case back allows wearers to observe all that precision in action. Up front however is where the most dramatic departure from the norm takes place. The Cerachrom bezel has been swapped for one machined from a solid block of forged carbon, the tachymeter scale calibrated to 500 units rather than the usual 400. The dial, again heavily skeletonized, has also been hand beveled and is outfitted with the Daytona’s regular tri-compax sub counters, now painted in yellow, blue and red; the colors of the Colombian flag. The pencil-shaped subsidiary hands, new to this version, are similarly colored to match their dials and the sandblasted chronograph second hand has been topped with a red arrowhead. Elsewhere, all is as you would expect. The 40mm Oystersteel case has been left well alone, complete with its pair of screw down pushers flanking the Triplock crown, giving the La Montoya a 100m water resistance. The main handset is also as you will find on the stock model, crafted in white gold and filled with Chromalight. The luminescent indexes however are all small circles rather than batons. In all, it is a striking watch, and a fascinating one regardless of whether or not the thought of a customized version of such a fundamentally classic design appeals to you. Some purists will see it as sacrilege, others as a welcome alternative for a model that is becoming ubiquitous, irrespective of the difficulty in getting hold of one. But if the regular piece is a challenge to find, the La Montoya is something else again. Engraved around the circumference of that crystal case back, alongside ‘Les Artisans de Genève’ and ‘Juan Pablo Montoya’ is each piece’s individual issue number—limited to a run of just 50. And at a price of some EUR 42,260 a pop, it could take both the bank balance as well as the horological tastes of a Formula 1 icon to secure one for yourself.